Older adults need about the same amount of sleep as all adults—7 to 9 hours each night. But, older people tend to go to sleep earlier and get up earlier than they did when they were younger. 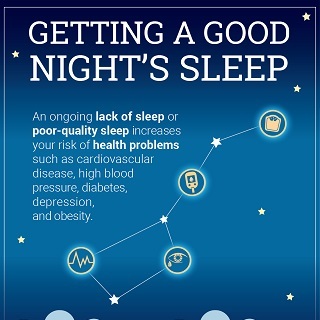 Read and share this infographic to get tips on how to get a good night's sleep. Developing healthy habits at bedtime may help you get a good night’s sleep. People with sleep apnea have short pauses in breathing while they are asleep. These pauses may happen many times during the night. If not treated, sleep apnea can lead to other problems, such as high blood pressure, stroke, or memory loss. You can have sleep apnea and not even know it. Feeling sleepy during the day and being told you are snoring loudly at night could be signs that you have sleep apnea. If you think you have sleep apnea, see a doctor who can treat this sleep problem. You may need to learn to sleep in a position that keeps your airways open. Treatment using a continuous positive airway pressure (CPAP) device almost always helps people with sleep apnea. A dental device or surgery may also help. Restless legs syndrome, periodic limb movement disorder, and rapid eye movement sleep behavior disorder are common in older adults. These movement disorders can rob you of needed sleep. People with restless legs syndrome, or RLS, feel like there is tingling, crawling, or pins and needles in one or both legs. This feeling is worse at night. See your doctor for more information about medicines to treat RLS. Periodic limb movement disorder, or PLMD, causes people to jerk and kick their legs every 20 to 40 seconds during sleep. Medication, warm baths, exercise, and relaxation exercises can help. Rapid eye movement, or REM, sleep behavior disorder is another condition that may make it harder to get a good night’s sleep. During normal REM sleep, your muscles cannot move, so your body stays still. But, if you have REM sleep behavior disorder, your muscles can move and your sleep is disrupted. Alzheimer’s disease often changes a person’s sleeping habits. Some people with Alzheimer’s disease sleep too much; others don’t sleep enough. Some people wake up many times during the night; others wander or yell at night. The person with Alzheimer’s disease isn’t the only one who loses sleep. Caregivers may have sleepless nights, leaving them tired for the challenges they face. Have a lamp within reach that is easy to turn on. Remove area rugs so you won’t trip if you get out of bed during the night.